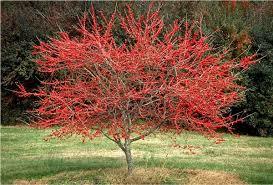 The Possomhaw Holly Plant is a gray shrug known for its broad green leaves and bright red berries. Thriving in sunny or partly sunny environments, these plants are native to different areas of Virginia, Illinois, Texas, Florida, and everywhere in between. These plants are adapted to most soil types and prefer moist ground with semi-frequent watering. Even after losing their leaves during the winter, their trademark berries will remain on branches. Maturing at up to 36 feet in height, they can add a lovely spot of color to any yard or landscaping project and can even be cultivated for food with their edible berries. also called Ilex Decidua. Can adapt to a broad range of soil conditions with no problem at all. The dark green color and bright white flowers during the spring and summer make it stand out in your landscape. These leaves will turn yellow during the fall months. 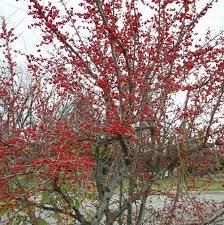 The Possumhaw Holly Tree is a small, deciduous tree that offers both pleasing blossoms and bright berries. The tree features pale gray bark, green leaves, white flowers and red seeds. In the spring, the tree forms smooth, shiny dark green leaves reminiscent of the traditional holly bush that we think of around Christmas time. In late spring, the tree blossoms with clusters of tiny, delicate white flowers with yellow centers. The leaves of this tree will turn yellow or light brown in the fall and drop off. This is also when the berries begin to show off. Vibrantly orange or red beans, which began production in the summer, reach their height of color in fall and winter, making this tree a beautiful addition to your winter garden. The crown of the tree is usually rounded. Between the white flowers in the spring and the red berries in the fall and winter, this tree is an ideal decorative addition to your garden year round. 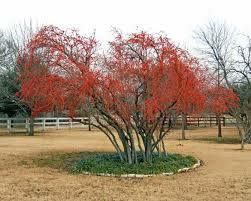 Possumhaw Holly Plant will form a dense thicket as they mature, making a beautiful hedgerow to surround a yard or garden.